What factors affect countries having different food staples? What is a food staple? A food staple is a food that makes up the dominant part of a population's diet, they are eaten regularly, even daily. Most food staples are inexpensive, and are usually plant based foods. There are more than 50,000 edible plants in the world, but 15 of them provide 90 percent of the world’s food energy intake. Some examples of foods that are staples in some countries are corn (maize) , rice and wheat. 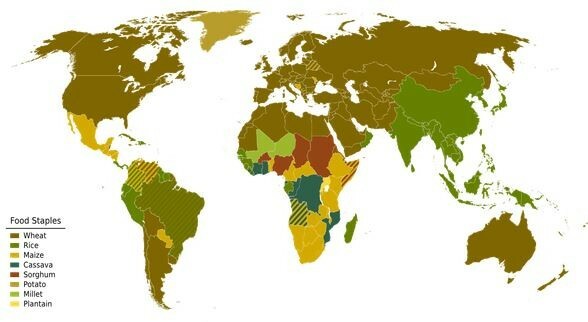 Climate- The food staples can vary from country to country depending on the climate, whether it is hot, cold, wet or dry and all be factors that affect food staple. Cultures indigenous to polar climates, where fresh fruits and vegetables are scarce, rely on meat and fish as food staples. Often, seafood provides the majority of their energy and nutrient needs. For example, Eskimo tribes of Alaska and northern Canada have traditionally eaten seal, walrus, and whale meat in addition to many kinds of fish. In tropical climates, people often rely on starchy fruits such as plantains and breadfruit. In parts of Africa and Asia, especially India, legumes such as beans, lentils, and chickpeas are staple foods. Rice is a food staple for more than 1.6 billion people around the world, particularly in Asia, Latin America, and parts of Africa. Rice has been cultivated in Asia for thousands of years. Scientists believe people first domesticated rice in India or Southeast Asia. Rice arrived in Japan in about 100 BCE. The Portuguese most likely introduced it into South America in the 16th century. Today, the world’s largest rice producers are China, India, and Indonesia. Outside of Asia, Brazil is the largest rice producer. Rice grows in warm, wet climates. It thrives in waterlogged soil, such as in the floodplains of Asian rivers such as the Ganges and the Mekong. “Floating rice” is a variety of rice that is adapted to deep flooding, and is grown in eastern Pakistan, Vietnam, and Burma. 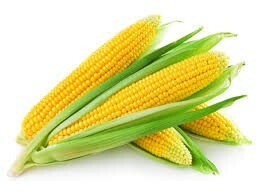 Corn, known outside the United States as maize, is native to Central America, where it was domesticated by the Aztecs and Mayans. Corn remains the most widely grown crop in the Americas today. The United States is the world’s largest corn grower, producing more than 40 percent of the world’s corn. China, Brazil, Mexico, and Argentina also produce large amounts of corn. There are many factors that affect the growth of corn that can lead to affecting the food production, climate, fertilisation and moisture. These factors all have a great impact on the production of corn. Wheat grows well in temperate climates, even those with a short growing season. 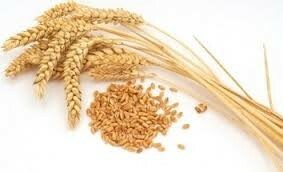 Today, the largest wheat producers are China, India, the United States, Russia, and France. The majority of breads are made with wheat flour. Wheat flour is also used in pasta, pastries, crackers, breakfast cereals, and noodles. Starting in the 19th century, wheat joined corn as a popular ingredient for making tortillas. Wheat can be crushed into bulgur, which has a high nutritional value and is often used in soups and pastries in the Middle East. The Conditions that are good to grow wheat, is that they need about 31-38 cm of water and they thrive in damp whether so they grow really well in countries that have a low humidity because they grow better. they grow best when temperatures are about 21-24°C, they also need a lot of sunshine. Food staples are often produced in mass when it comes to the production of them. There are many factors that affect the food staple growth which then can massively affect the production of them. One of these factors is the uncertain Climate. Changes in the world's climate will bring major shifts in food production. In some places, temperatures will rise and rainfall will increase; in others, rainfall will decrease. In addition., coastal flooding will reduce the amount of land available for agriculture. In general, food crops are sensitive to climate change. Such change, which affects soil temperature and moisture levels, also determines the vitality of both beneficial organisms and pests. Due to the enormous uncertainties surrounding global climate change, estimates of cropland reductions vary widely from 10 to 50 percent. But this much is clear: global warming is likely to alter production of rice, wheat, corn, soybeans, and potatoes which are staples for billions of people and major food crops in both North America and Africa. Encyclopedic entry. A food staple is a food that makes up the dominant part of a population’s diet. Food staples are eaten regularly—even daily—and supply a major proportion of a person’s energy and nutritional needs.